Because Grand Rapids Christian Schools is committed to making a Christian education accessible to families from a range of economic backgrounds and recognizes that many families who might not expect to be eligible for “financial aid” may still qualify to pay a reduced tuition rate, we now offer a range of rates called Variable Tuition. 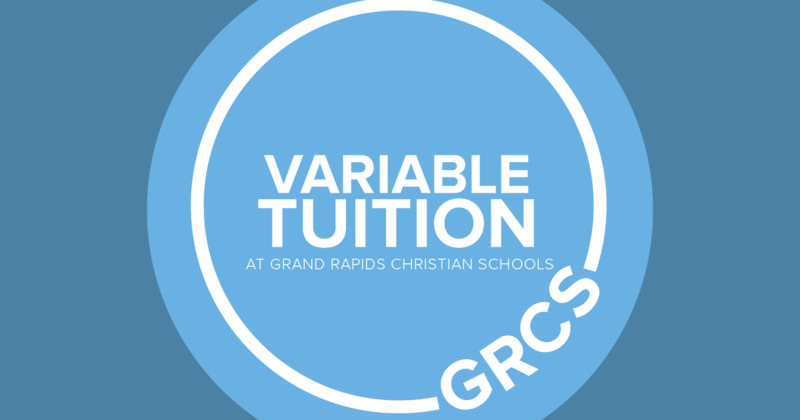 Ready to apply for Variable Tuition at Grand Rapids Christian Schools? Click the button below to begin the FACTS Application, the first step in applying for Variable Tuition. What are the Variable Tuition Rates for the 2019-2020 school year? Tell me more about Variable Tuition. How does Variable Tuition compare to the old Required/Requested tuition system? My child will be in preschool. Should I apply for Variable Tuition? What will my Variable Tuition amount be? Do I need to apply to Grand Rapids Christian before I can apply for Variable Tuition? If I receive tuition support from my church or employer, how does that work with Variable Tuition? Does everyone who applies receive Variable Tuition? If I do not qualify for Variable Tuition this year, can I apply again next year? Will Variable Tuition lead to larger class sizes? Click here to view GRCS preschool options and tuition rates. Variable Tuition allows families to apply for a reduced tuition rate that is based on their family’s unique financial situation. While every family is expected to contribute to the cost of tuition and to support Grand Rapids Christian Schools in some way, the Variable Tuition program offers families an appropriate tuition level, making a quality Christian school education accessible for more families within our community. By making a Grand Rapids Christian education more financially possible, we will have the opportunity to fully utilize our exceptional staff and outstanding facilities and bring a rich diversity of students and families to our schools. Any family (current or new) of a kindergarten through twelfth grade student may apply for Variable Tuition if they are concerned about affording the full tuition rate at GRCS. Many factors are considered when determining the tuition amount a family is able to pay, including income, assets, unusual expenses, and the size of the family and are reviewed by a third party: FACTS Grant & Aid. Families who do not apply for variable tuition pay full tuition. The old tuition model had two rates for each grade level - a requested rate and a required rate. Variable Tuition sets a range of tuition rates for each grade level K-12. The “full tuition” amount or the top of each Variable Tuition range is comparable to the old Required tuition rate. The old Requested rate included annual tax-deductible donations of approximately $2500 per student. These donations always have been and continue to be vital to the financial stability of our schools. Families who are able to and/or previously opted to pay the Requested rate are now asked to select the Full Tuition and also elect to include the Requested Donation when completing their Continuous Enrollment Contract. Variable Tuition only applies to students in kindergarten through 12th grade. If you only have children enrolling in preschool at GRCS, you should not apply for Variable Tuition. If you are enrolling a preschool student in addition to older students in K-12, you may apply for Variable Tuition. We will consider your preschool tuition as part of your family’s financial profile when we determine your Variable Tuition rate. All Variable Tuition applications must be submitted online to FACTS Grant & Aid. There is a $35 fee to apply. Click HERE to begin the FACTS Grand & Aid Application. Or contact a member of the Admissions Team for more information or questions on how to apply. Family circumstances range widely. While some families can afford only minimal tuition, others can afford to pay around the midpoint or almost at the top of the tuition level. Many factors are evaluated, including income, assets, unusual expenses, and the size of the family. No. An application for Variable Tuition does not affect the re-enrollment or admissions process. Regardless of financial need, parents should initiate the process as early as possible. Because the formula used to calculate variable tuition considers many factors, it is not possible to estimate the tuition level for which a family qualifies without the completion of a Variable Tuition application. Applications are submitted directly to FACTS, a third-party agency. FACTS evaluates the application based on criteria set by the school and makes a recommendation to the school’s Variable Tuition team. Families are notified of the tuition level for which they qualify by the school’s finance office. No. You may apply for Variable Tuition before you apply for admission. However, we do recommend that you complete the Online Inquiry Form either before or soon after you apply for Variable Tuition. This will alert our Admissions Team to your interest in Grand Rapids Christian Schools so that we can be watching for your Variable Tuition application to come to us from FACTS. Please note that applications must be fully completed, and all required paperwork must be submitted to FACTS in order for applications to be released to GRCS for review. For 2019-2020 applications, this includes your 2017 tax returns. You will receive your variable tuition offer approximately two weeks after Grand Rapids Christian Schools receives your financial profile from FACTS. Responses to families will fall into three categories: an offer of Variable Tuition, notification that a family does not qualify for Variable Tuition, or notice that the family is waitlisted for Variable Tuition. A waitlist designation means that a family will be considered for Variable Tuition if additional funding becomes available. Grand Rapids Christian Schools is blessed to partner with many area churches who provide significant tuition support to their families. As in previous years, you should apply to your church first. Your church will use the Full Tuition amount when determining the amount of assistance they will provide. The "Full Tuition" amount in this new program is equivalent to the "Required" (lower) rate in the old system, and parents do not need to apply for Variable Tuition in order to pay that rate. Calvin College also provides tuition support to their employees. You should apply to Calvin first. They will also base their award on the Full Tuition amount. Families who only receive financial aid from their church or from Calvin, do not need to apply for variable tuition through Grand Rapids Christian. If you believe you will need support in addition to the award from your church or Calvin, you may also apply for Variable Tuition by submitting an application through FACTS. Applying to your church or Calvin first, simply means that we will need to know your church or Calvin award before we can determine if you qualify for an even lower variable tuition rate through GRCS. Unfortunately, we do not have the resources to offer Variable Tuition to every student who qualifies for both admission and reduced tuition. We work within our available resources to make GRCS accessible to as many students and families as possible. However, a student may be admitted to GRCS but waitlisted for Variable Tuition. Yes. A family that does not qualify this year is welcome to reapply the following year. No. The leadership team at GRCS has established maximum class sizes that cannot be surpassed. Questions about Variable Tuition should be directed to Jim Primus at JPrimus@grcs.org.